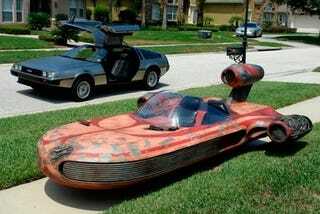 Yes, that's a real landspeeder, just like Luke Skywalker's X-34 in Star Wars. No computer-generated Hollywood movie magic here. Well, except that it doesn't exactly hover. The fiberglass body is mounted on a custom aluminum electric car chassis. With a top speed of only about 25 MPH, it's going to take awhile to get across the Tatooine desert, seeing as the three thrusters are non-functional. But it sure does make the neighbor kid's Power Wheels truck look lame.